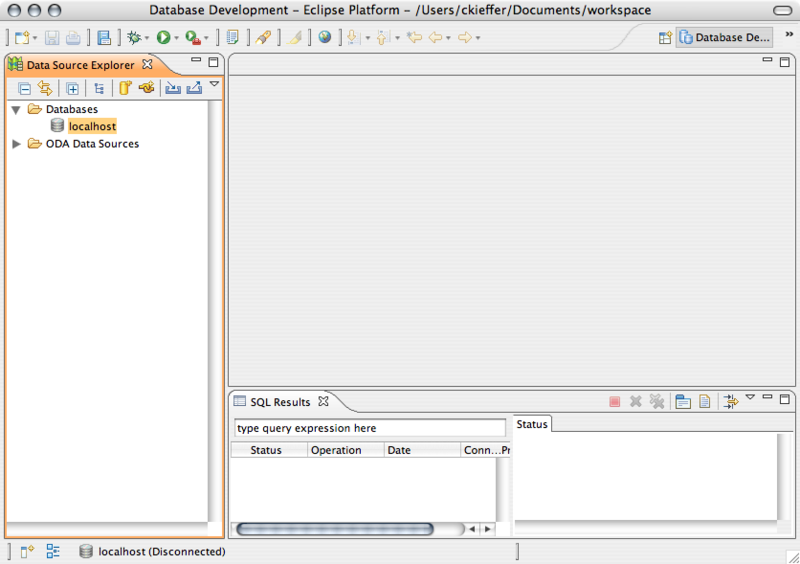 The Eclipse Data Tools Platform (DTP) is a standard Eclipse plugin that you can use to perform most database development and query functions. 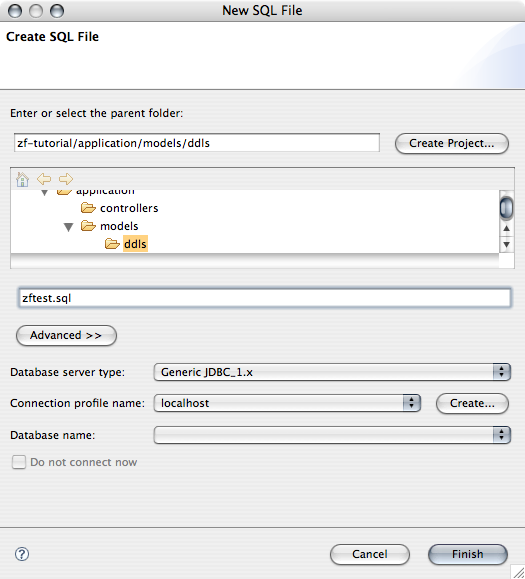 The DTP plugin supports several database platforms via JDBC, including Derby, Oracle, MS SQL, Postgres, Sybase ASA, Flat Files, XML Data, Web Services, and more. This post covers connecting to MySQL and basic DTP features. I'll assume that you're comfortable installing Eclipse and Eclipse plugins . I'm also assuming that you've used Eclipse for a bit and have at least one project defined. Here's what you'll need before we get started. Eclipse with the DTP plugin, I'm running Eclipse 3.3 which came bundled with DTP version 1.5.0. MySQL JDBC Driver, I'm using Connect/J 5.1. MySQL Server version 4 or 5 running on localhost or a remote host that allows remote connections. MySQL user account with a database or privileges to create databases. Installing Eclipse and DTP does not install JDBC drivers. You must install the appropriate driver for the database server you're using. You can usually get drivers from the vendor. I downloaded the MySQL Connector/J. Select 'Connector/J' in the left menu, then select a version. I used version 5.1. Download the source and binaries and save somewhere that makes sense for your OS. I dropped mine in /Library/Java/Extensions on my Mac. Next, create a driver template and a connection profile. You'll be able to reuse this template when creating future connection profiles. 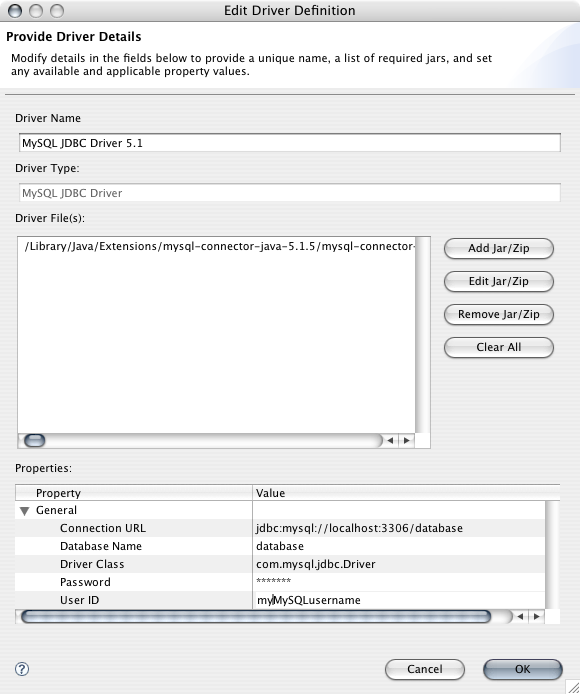 Click on the ... button to add your JDBC driver to the Select a driver dropdown menu. Expand the Available Driver Templates folders, select "MySQL JDBC Driver"
Add the driver version to the Driver Name, I changed mine to "MySQL JDBC Driver 5.1"
Note: Don't be confused by differences in server and driver versions. You can use the 5.1 driver to connect to MySQL 4.x. Eclipse will display an "Unable to locate jar/zip..." message. Tell Eclipse where the JDBC driver is. Add Optional Properties to those you just set or check the "Save Password" box if you'd like. Click the "Test Connection" button, hopefully your Ping succeeded! If not, double check your connection properties. 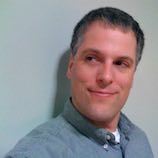 With a connection template and profile defined, open up the Database Development Perspective, if it isn't already open. 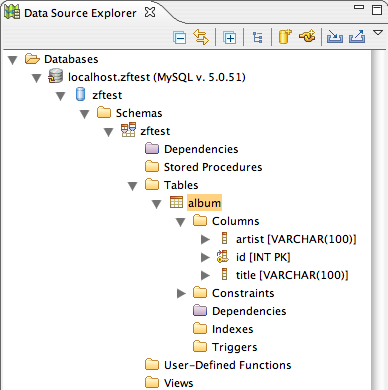 In the Data Source Explorer pane, expand the Database folder. You can create and modify tables, triggers, stored procedures directly via DTP. Before proceeding, open an existing or create a new Eclipse project. You'll save SQL files to an existing project which makes it easy to place them under version control with the rest of your application files. Select File > New > SQL File (or File > New > Other > SQL Development > SQL File). Choose the project and folder where you'll save the file. 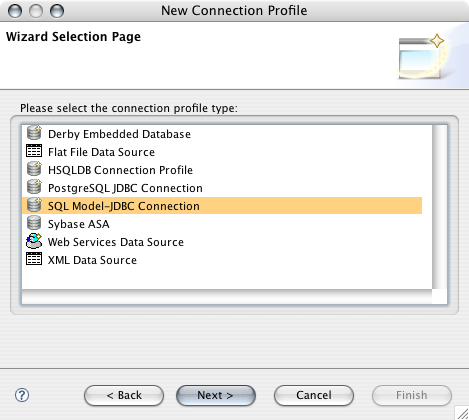 Select the Database server type, Connection profile, and Database name. You can skip specifying the database if you're going to create one with the file. Type in the SQL you'd like to run. Select all, or a portion, of the SQL to run. Right-click in the document tab and select either Execute All or Execute Selected Text. Review the SQL Results at the bottom of the SQL Development Perspective. The buttons in the SQL Results tab allow you to track the status for all SQL executed and provide a handy filter for sifting through results. Easy, isn't it? You probably noticed other nifty features under the Data menu, including Load and Extract. These options allow you to import and export delimitied data from files. Overall I'm very happy with DTP. It's been a bit of an adjustment getting used to how things are done, but I no longer have to get off the Eclipse "couch" to take care of SQL development tasks. I've covered most of the basics here but I think you'll find several other useful features. Happy data developing!